CALL US NOW IF YOU ARE HAVING ISSUES WITH YOUR GE MONOGRAM REFRIGERATOR! We are open 24/7. Your GE Monogram refrigerator plays an important role in your daily life. So, when you notice a problem, you want to make sure it doesn’t develop into something bigger. Something seemingly simple like a bit of condensation on the door or a little extra frost on your steaks may seem like a small problem, but it can get much worse if ignored. 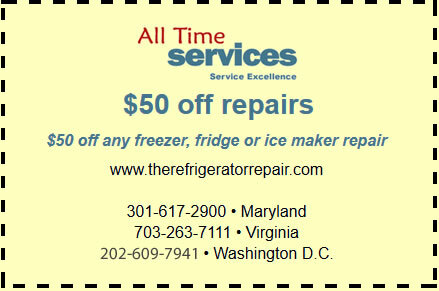 For professional GE Monogram refrigerator repair service Virginia, Washington DC , Maryland, Arlington and in the greater Washington D.C. area, call All Time Services at the first sign of trouble. Our fridge repair technicians have years of experience quickly diagnosing and resolving any and all refrigerator issues. It’s important to take note of any problems your GE Monogram refrigerator has so that you can explain them to your technician when they arrive at your home. Even the smallest problems with your fridge can be symptomatic of a much larger issue, but it is good to provide as much information as possible so the fix is targeted to resolve the issues. Malfunctioning thermostats are among the more common problems, where the compressor continues to cool even when the right temperature is reached, usually leading to frozen food in the refrigerator unit. You might also notice leaks in various parts of your GE Monogram refrigerator. Pools of water on the floor or in the fridge, or condensation on the unit are all signs of a problem. If you have a compressor or motor problem, you’ll notice sudden or ongoing noises and the compressor may fail to turn off when it is supposed to. If this happens, you should call someone immediately as food could spoil without you even realizing it. Some of these problems can go on for months or even years before your refrigerator breaks, but if you ignore them, it will eventually break. Not only that, but you’ll pay extra in electricity and you’ll likely have to throw out a lot of food that spoils. If you’re in need of an expert to inspect and repair your GE Monogram refrigerator, look no further than All Time Services. 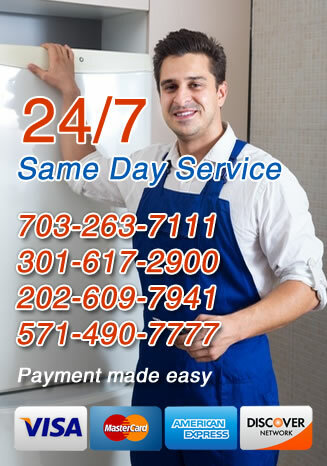 With years of experience of GE Monogram refrigerator repair service in Virginia, Washington DC , Maryland, Arlington, VA, Gaithersburg, MD and the surrounding areas, you can rest assured that we’ll get the job done right and quickly. Call us now to discuss your options and set up an appointment with a technician.